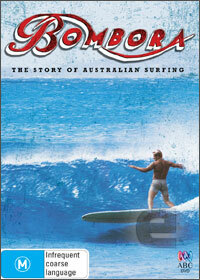 Recently screened on the ABC, Bombora the Story of Australian Surfing is a must have documentary for lovers of surfing or sports and goes into great insights of how this fringe sport became an integral part of Australian sports and culture. Featuring some of the founding members of surfing in Australia, Bombora features a "pumping" soundtrack that matches the documentary and stories perfectly. The documentary uses a variety of footage and seeing some of these men surf the waves on the limited boards of the times is quite inspirational and shows their spirit as forefathers and adventures of the sport. It's amazing how far surfing has come in this country and with that said, worldwide. It was a simpler time when commercialism didn't exist and the sport was almost an exclusive only members section. Very well presented that can be watched by all people, however watch it on a bigscreen with the sound turned up! Surf on!